And the tapestry of lies, damned lies and statistics that is REF2014 keeps on unraveling. 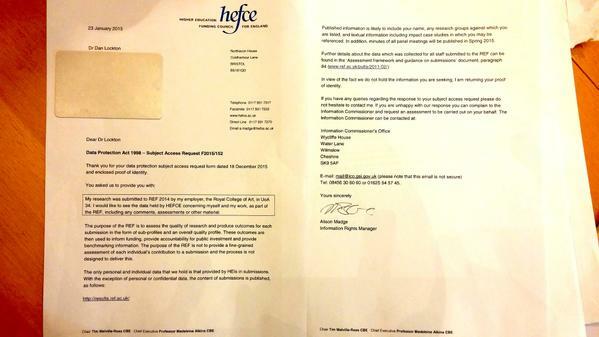 I learn from this morning’s Twitterfeed that Dr Dan Lockton, of the Royal College of Art, and Professor Melissa Terras, Professor of Digital Humanities and Director of the UCL Centre for Digital Humanities, have received identical letters in response to requests under the Freedom of Information Act for HEFCE to disclose information held on them in connection with the REF. “Can you provide the scores for my outputs that were submitted to the REF? Yes, but. At the risk of appearing obtuse, I would have thought that when 65% of the overall quality profile rests on REF subpanels’ assessment of the quality of individuals’ outputs, we would expect “fine-grained assessment” of those outputs. Is this not why we have this cumbersome, time-consuming, expensive process of panel evaluation—as distinct, for instance, from using metrics—to begin with? If it’s not fine-grained assessment, what sort of assessment is it? And how can we trust it to provide a reliable basis for funding decisions, accountability for public investment, or benchmarking? In the immortal words of Amy Winehouse, what kind of fuckery is this? Zoe Corbyn, ‘Panels ordered to shred all RAE records’. Times Higher Education, 17 April 2008. Next Post: Surrealism and sociology: unlikely bedfellows?